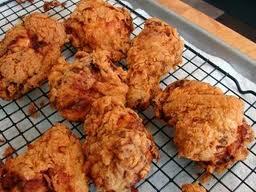 Fried chicken without the grease. Asian aisle of most supermarkets. Unseasoned dry bread crumbs can be substituted. 2. Preheat oven to 400°F. Line 2 baking sheets with foil; spray with cooking spray. Set aside. baking sheets; let stand 10 minutes.